Join us at 1300 Washington Street, Hoboken, NJ! Please join us on Thursday June 7th at Crystal Springs Resort to be a part of Hudson County's largest golf outing and show your support for various local schools serving thousands of children in our community. 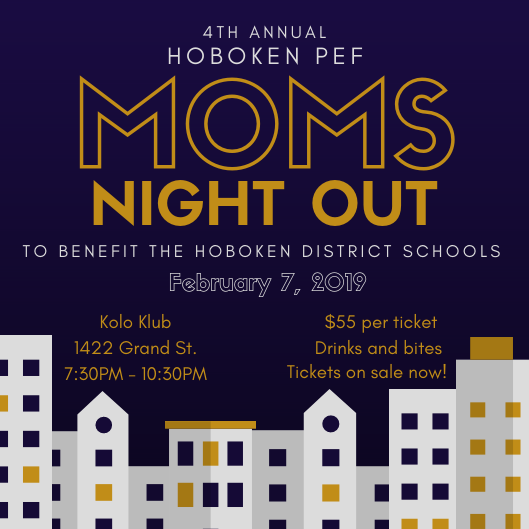 Hoboken PEF is proud to be joining various other local schools in this event including: Elysian Charter School, Hoboken Charter School, Hoboken Dual Language Charter School (HOLA), All Saints Episcopal Day School, Mustard Seed School and Stevens Cooperative School. Registration: $50 per person. Must be purchased in advance. Join Hoboken PEF in kicking off the school year with a fun and challenging workout at the Fit Foundry! The Hoboken Public Education Foundation’s 2nd Annual Spring Gala at the W Hoboken is sold-out! Thank you to all our supporters who bought tickets. We are currently at capacity for this event, but will post an update should more tickets be released. Please note, no tickets will be sold at the door. A free screening of Screenagers, a documentary from filmmaker Delaney Ruston that examines the impact of screen time on children's development. Open to the public, adults only. Please register in advance at this link. Sip and socialize while supporting a good cause! Register here. Join HYP’s Patrick Franco for an inspiring 1-hour yoga class with live music at Local Barre’s beautiful West location. Hang out after class for drinks and other goodies. All levels are welcome, and all proceeds go to HPEF! Please join us for an exclusive, VIP shopping party for HPEF members with 25% off the entire store! Calling all Athleta lovers! Come shop in support of HPEF and receive 20% off one item! A portion of the proceeds during this event will be donated back to HPEF. Bagels and mimosas will be provided for all HPEF shoppers! Beautycounter products will also be on hand for purchase. Join HPEF for a family night out at Pier 13! We'll have a free balloon twister to celebrate our first year! The Hoboken Public Education Foundation is holding its inaugural HPEF Spring Gala at the W Hotel(Lulu’s) on May 19, 2016, 7:30 – 10:30 p.m. Along with Mayor Dawn Zimmer we will officially celebrate the launch of the foundation and our first-year successes, while continuing to generate enthusiasm surrounding the achievement of longer term goals. Please join us for an exclusive, VIP shopping party for HPEF friends with 25% off the entire store! Come shop with your fellow HPEF members and friends after dropping off the kids at school and enjoy mimosas, brunch, raffles, and special surprises! Spin & Social with refreshments and raffles following a 45 minute spin-at-your-own pace to raise money for HPEF! We will have a table set up at Athleta. Come and learn about us and a portion of the sales will benefit HPEF! Right before Thanksgiving, we launched our 2015 Year End Giving Campaign. Follow us on Facebook for updates. Reading about our 2015 - 2016 initiatives. Make a donation here! Time is ticking... Help us reach our 2015-2016 Annual Fund Goal of $100,000 and help our Hoboken Public Schools. We will have a table at the Hoboken Harvest Festival at Pier A Park. Stop by for some fun treats and to learn more about HPEF.